Like my post from last year, I’m sharing my top books for the year. 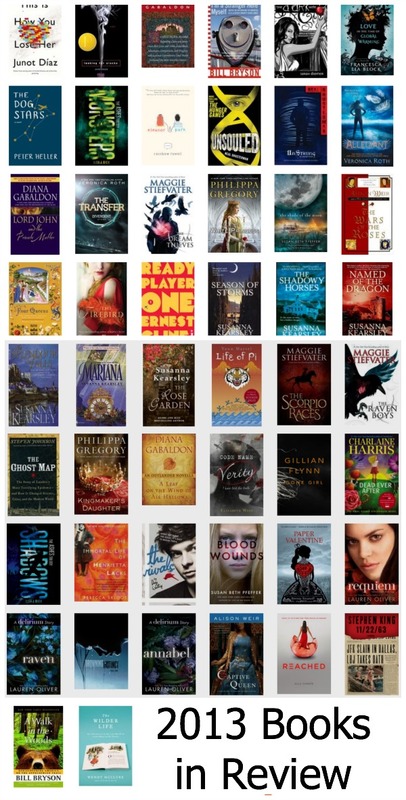 For 2013, I had the added goal of getting through 50 books for my 30 Before 30 list. Thankfully I got all 50 books in by December 30. This year I’ll scale it back a touch knowing I have some giant books on my “to read” list. You can see my 2013 list in full on Goodreads or follow along in my sidebar for 2014’s progress. This year I had 9 favorites. When I look at the list most of them seem outside of my comfort zone but they all make the list for the effects they had on me. They almost left me with a sense of melancholy since they aren’t all “fun” but the books were as a whole so beautiful that I want you to know that melancholy is a great thing here. I want a book that makes me feel or makes me think and this year’s favorites all do that. This book was a humorous take on Byson’s attempt to hike the Appalachian Trail. I came away definitely not wanting to hike the trail but with the goal of wanting to reconnect with nature. I started running again, took up hiking and got myself a bike. I plan to spend 2 of my next trips engaging in hiking. I know this one is a little old but with the JFK anniversary this year, I figured why not add it to the list. I’m not the biggest King fan but give me a book about time travel, history, love, and mystery and I can’t put it down. This book left me thinking about paradoxes and marathoning Doctor Who again. Reading this reminded me of my college dinner and a book class with its discussion of medicine and ethics. Henrietta Lacks and her family were focused on just as much as the legacy of her cells. If you don’t know about Henrietta, there are few people who have made such a dent on science as her. I owe my own life to the discoveries that came with her cells and yet her own family’s suffering continues. WWII, best friends, female badasses and the biggest heartbreak of the year all in a young adult book. The book itself is set as a confession at the end of a life and it made me really think about the value of my own life. Again with my love of nonfiction microhistories. This one has to do with the spread of cholera in Victorian London. I enjoyed looking at the past through the knowledge of the day and seeing how “knowing” and knowing are two very different things. I confess I read 3 of Stiefvater’s books this year and wanted to include them all on this list. The Raven Boys mixes private schools, a reversal on the manic pixie dream girl trope, mystery, fate, death, belief, and family in a crazy plot that will probably make you grab its sequel, The Dream Thieves, as soon as you finish. I read this book and was just engrossed and wanted my life to be that exciting. The following summary is the exact opposite kind of book I should love based on the description: A teenage boy obsessed with video games and peak Gen-X pop culture tries to solve a mystery that’s unsolvable. What that summary doesn’t tell you is that this is a book about overthrowing the worst of society, reconnecting in an isolationist world, and personal growth. I read 8 books on vacation this year and this was the best of the best. It stuck with me because despite being a futuristic young adult book set with my own past, it applies so much to today’s world. This book is on nearly every top books list of the year and it deserves to be. It pairs nicely with Ready Player One. This young adult book deals with pop culture, feeling like an outsider and living life with an overwhelming sense of courage every day. The characters were real enough that I wanted the best for them even when they didn’t always get it because life isn’t fair. Another book set in the future, this one made me so lonely. The author explains how empty the main character feels in his solitude and it just exudes through the pages into you. While this book left me sobbing at times it gave me so much hope in the end that I couldn’t let this list go without including it.